The Gini coefficient is a measure of the inequality of something's distribution, where a value of 0 represents total equality and a value of 1 maximal inequality. Is it possible to perform this type of estimate on how bitcoins are distributed throughout the userbase? And/or is it possible to tell how this distribution is changing over time? 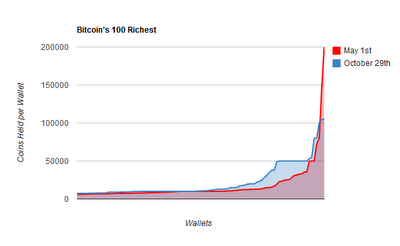 The Bitcoin Report site also releases a regular report on the number of bitcoins in the top 100 wallets. Although one person can own multiple wallets or a wallet of a exchange (e.g. MtGox) may contain coins with multiple owners so it is impossible to know for certain the real wealth distribution but it may have some correlation. The Bitcoin Trader blog used the Bitcoin report data on the top 100 wallets and compared the data from May 1st and Oct. 29th 2011. The distribution of coins among the top 100 has evened out, as can be seen in the chart. Even though 1,310,000 Bitcoins have been mined since May 1st, the top 100 have still managed to increase their relative wealth, and now hold 29.8% of all the Bitcoins ever created! While certainly not perfect these type of statistics may be give some indication of the trends in the wealth distribution in the bitcoin economy. Once you have the relevent statistics this is easy. Collecting those statistics is hard though, due to bitcoins level of anonymity. You would probably need to do a survey. It is possible, you will first need to collect statistics on bitcoin usage. Are there statistics on how Bitcoin holdings are spread among addresses?